It’s common for schools, collegiate or lower—to set time aside to showcase different clubs and student organizations to potential new members. It can be a lot of fun, with a lot of positive vibes going around. However, there is also slight undercurrent of competition, buried deep down. Ultimately each club is competing against the others. Both for the time of people who would join it and for new members. Wintermoor Tactics Club goes several steps further by featuring a nonlethal battle royale conflict between school clubs. When Wintermoor Academy’s principal randomly orders a snowball tournament to find the “Ultimate Club,” the stakes are high. Defeated clubs must permanently disband. The story starts firmly in the corner of Alicia, Colin, and Robbie, members of the club for Curses & Catacombs, a fantasy RPG tabletop game. They hope their tabletop tactics will help them win on the snowball field and secure their right to continue playing on campus. Developed by EVC, Wintermoor was part of the Indie MEGABOOTH at GDC 2019. Like other featured games, EVC had the game ready to demo with beanbags for seating. Their display table stood out a little with various dice scattered on the surface, a physical tie-in to Wintermoor’s literal use of a fictional tabletop RPG like Curses & Catacombs. The game-within-a-game is a clear reference to the iconic Dungeons & Dragons, which has enjoyed more attention lately, thanks to the mainstream appeal of Critical Role, The Adventure Zone, and Stranger Things. The Indie Megabooth table for Wintermoor Tactics Club at GDC 2019 had business cards, promotional pins, and different types of dice spread out on its surface. That love became even more clear as Kreitzberg explained dice types on the game’s display table, talking about those that deal damage, and which are polyhedral. According to Kreitzberg, coming up with Curses & Catacombs as an analogue to Dungeons & Dragons happened pretty quickly. In contrast, she said that creating the battle system has been a longer process, and is something that remains in development. “Everybody’s abilities have changed pretty drastically, except for Alicia’s,” Kreitzberg said, explaining that the main character’s magic missile has remained largely the same. Alicia’s magic missile can hit multiple opponents at once if used correctly. The first chapters of the game provide the basics of battle. As the player progresses, Kreitzberg said the combat system would become more complex. She listed examples like new techniques, consumables, and other characters that can be recruited into your party. Anderson talked more about the battle system in Wintermoor. They explained that they didn’t want the combat to interfere with the story or visual novel elements of the game. Colin is the club leader and apparent dungeon master of the Curses & Catacombs campaign. They also preferred slowly introducing combat mechanics. “Want to introduce at least one new thing in every battle,” Anderson said. At the same time, they didn’t want to overload on mechanics. But Anderson felt that persistent novelty and how you play the game can be its own story. “When [players] get to the end, they can express themselves the way they want to, because they have that understanding [of the combat system],” Anderson said. Players can only use three characters in battle at a time. Anderson explained that the characters chosen in the game’s final battle tie into the player’s preferences and unique progression. Though it may take a while, players can eventually swap the entire default party out for different characters. The player can fight with a party of three. During the demo, I noticed that dialogue seemed to closely match what happened in combat. For example, an enemy responded very specifically to Robbie, who had attacked first, and Robbie reciprocated with his own response. That made me wonder if the response would have differed if Alicia or Colin attacked first instead? Anderson confirmed that in every battle, conditional dialogue will happen if certain events occur. They said that due to this, many fights should be different. “[We] wanted battles and story to weave together, rather than have battle take a break and play a pre-set cutscene,” Anderson said. This formed the basis for how combat and story fit into Wintermoor. It seems like Wintermoor is gearing up for replayability with the promise of more characters that can trigger different dialogue options. Anderson also said that besides the mandatory or “golden path” upgrades, optional upgrades can also be unlocked. “[We] hope that [combat] gives a unique experience every time they play the game, even if it’s not a branching story,” Anderson said. Mike Sennott, composer for Wintermoor, shared the overall goal for the game’s music: Final Fantasy Tactics meets a Wes Anderson movie, like Moonrise Kingdom. Part of the demo involved helping Alicia find her friends and fellow club members. She finds Colin in the library fending off bullies. Sennott developed music to reflect each club. The Psychic Detectives club enjoys a noir, moody piano theme. Meanwhile, the New Wave appreciation club has its own fictional New Wave song. “It’s convenient that I’m cowriting the game and doing the music, because I know their personalities and can make themes to reflect that,” Sennott said. He and Kyla Furey work on writing Wintermoor together. Sennott shared that he and Furey have written together for a long time. He described their process; talking ideas beforehand, discussing different story beats and character actions, and trading off on writing drafts. “We have different things we look for, different priorities,” Sennott said, describing how he and Furey trust each other to work without egos. The game’s website lists Steven Universe as another influence, something that Kreitzberg expanded upon, saying that it’s “definitely a huge inspiration for our writers.” She then gave examples of how Wintermoor shares themes with Steven Universe, like a “funny, but earnest and heartfelt” tone; a lot of focus on inclusivity. It’s about misfits finding a space where they can be themselves and be accepted within their clubs. Ben Walker started Wintermoor, and works on directing and programming the game. 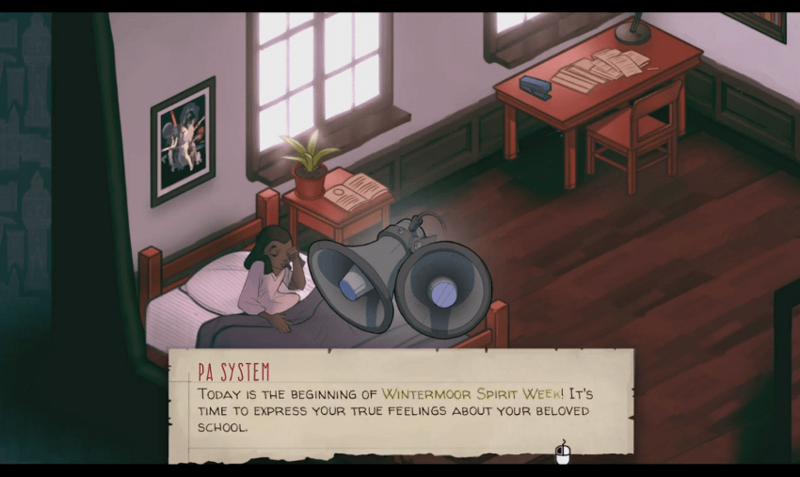 Wintermoor was born out of his desire to make a story game with systems, using the term ludonarrative consonance—where story and gameplay fit—as a goal. Walker described the genre mashup in Wintermoor as a Venn diagram of RPG tactics and visual novels. Walker has enjoyed taking tactics archetypes—like the tank and the healer—and creating characters that exist outside of them. For example, there is Colin the student, and Colin-as-Eodwald in Curses & Catacombs. Much of the demo at Indie Megabooth conveyed the idea of the two worlds coexisting. There’s the tabletop world of Curses & Catacombs and the normal world of Wintermoor Academy, and the characters have different roles in each. Colin—or his tabletop persona, Eodwald—is physically the toughest in the starting party. This lets him take more hits than Alicia and Robbie before he falls. On top of that, there’s the hint of crossover between the two worlds. For instance, toward the end of the demo, Colin suggests that he and his friends apply their tabletop game tactics to the snowball tournament. Anderson observed that it’s like a metaphor for people playing through their interpretation of the world to deal with it. Walker said he has been trying to figure out how to balance the game. Ultimately, wanting an RPG tactics game that can reach visual novel players as well. He shared that he’s looked at recent and upcoming games such as, Into the Breach and Necrobarista for inspiration on achieving that goal. With Into the Breach being incredibly well received, Walker hopes to capture that market. He also hopes that like Necrobarista, Wintermoor will be interesting enough to attract people from the visual novel crowd. The demo shows that part of the game will be devoted to playing out the Tactics Club’s tabletop campaign. Walker compared his hopes for crossover appeal to Undertale developer and composer Toby Fox. Fox also made music for the webcomic Homestuck, something that could have persuaded Homestuck fans to play Undertale. Walker didn’t want Wintermoor to be grimdark or too ironic. However, the trailer does end with a mysterious hooded figure and a vaguely ominous vibe. “There’s some mysterious things going on at school,” Sennott said. He added that part of the game will focus on determining why the principal is holding this harsh snowball tournament. It’s connected to the search for the “Ultimate Club,” Kreitzberg said. “It’s a game about clubs, and it’s a game about people getting very invested in their club,” Sennott said. While it’s good to find common ground with people that share your interests, variety is valuable too. “It’s important to make friends with people outside your club,” Sennott added. After a brief intro, the demo starts with Alicia in her dorm room at Wintermoor Academy. Wintermoor Tactics Club has been making progress. There’s a Steam page for the game, and it’s scheduled for a 2019 release. It even recently appeared on Game Informer’s radar, earning a spot on their lineup for the best indie games of GDC 2019.